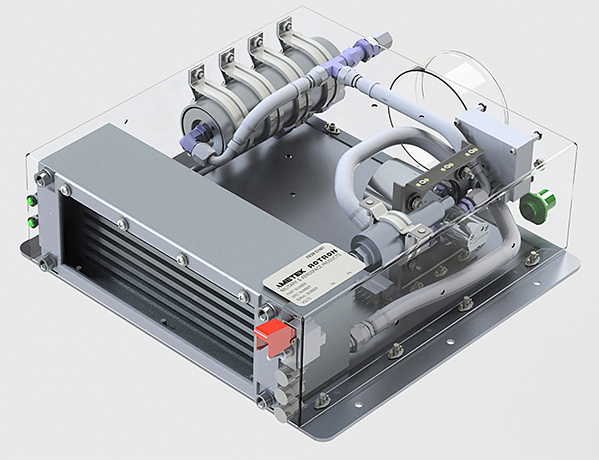 A lightweight liquid cooling heat exchanger that can operate in extreme conditions for airborne and military use has been introduced by AMETEK Rotron (www.rotron.com). The heat exchanger is part of a sub-assembly that is customized by Rotron to meet the thermal, packaging and operating environment requirements of each application. This unit has been qualified to meet a long list of mil-grade tests, including explosion-proof and stringent MIL-704 power quality requirements. It is qualified to cabin storage altitudes up to 7,985m/26,200 ft over a temperature range of -57°C to 74°C. Custom assemblies accommodate different input voltages, heat transfer rates, mounting and packaging options, and military grade environmental requirements. Models with analog or digital controls can display or produce fault signals, and provide manual or software-based operation of the units. The heat exchanger supports any installation with a liquid cooling loop, utilizing glycol and water mixtures or dielectric PAO [poly alpha olefin] fluid. High efficiency plate-fin heat exchanger cores can be paired with Rotron blowers and magnetic drive pumps to dissipate heat from an electronic source. AMETEK Rotron is a world leader in brushless DC motors, blowers and pumps for aerospace, military, mass-transit, medical and computer applications. It is a division of AMETEK, Inc., a leading global manufacturer of electronic instruments and electromechanical devices with annual sales of US$4.0 billion.